My best friend happened to be in town so we went to see Van Gogh's Sunflowers at the National Gallery. 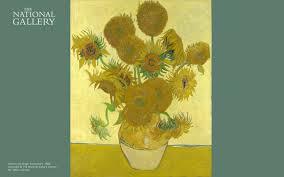 The exhibition was free as there were only two paintings - both sunflowers by Van Gogh - but the queue was long. Anyway the paintings were bigger than I expected. I stood in front of them soaking up the gorgeousness of the colour. Later my friend's only comment was that she thought the marketing machine had gone over-board for a couple of paintings of whithered flowers. What a pleb. Next time I go to an exhibition I'll take my partner instead. He's surprisingly appreciative of fine art for a suited business man.